Benzene is highly toxic, and the majority of aromatic compounds are toxic. Aromatic compounds are unsaturated hydrocarbon ring structures that exhibit special properties, including unusual stability, due to their aromaticity. Historically, the first aromatic compound is benzene, and as its first derivatives had pleasant aromas, were called aromatic compounds. Kekulé structure are different ways to represent the chemical benzene, and they were proposed by the scientist Kekulé in 1866, which bravely thought that benzene had a cyclic structure with three alternating C=C double and three C-C single bonds. Spectroscopy studies had shown that benzene has a planar ring, with all the carbon-carbon bond distances the same 1.397Å (C-C typically 1.48Å, C=C typically 1.34Å). Since the atoms are the same distance apart, and the only difference is the location of the pi electrons in the two Kekulé structures, they are in fact resonance structures of one another. In benzene, the bond angles are 120°, each carbon has an unhybridized p orbital, which lies perpendicular to the plane of the ring. These p orbitals each have 1 electron inside and there are therefore 6 electrons in the circle of pi orbitals. Benzene has 6 planar sp2 carbons, and therefore each carbon has an unhybridized p orbital. which are perfectly aligned for overlap. As these p orbitals create a continuous ring of orbitals above and below the plane of the carbon atoms, they create a cyclic, so a 3D, system of molecular orbitals. Based on benzene, aromatic compounds are planar cyclic structures in which each atom of the ring is a participant in a pi bond, resulting in delocalized electron density on both sides of the ring. How do we know if a compound is aromatic or not? E. Huckel proposed a formula which is now called the Huckel rule, which is the “4n+2 rule”. Based on this simple formula, cyclic π systems with 4n + 2 delocalised electrons are aromatic. So compound that have 6 (n=1), 10 (n=2), and 14 (n=3) electrons are aromatic. Benzene meets the criteria for aromaticity for n=1. A list of the most common aromatic compound can be found here. Toluene is a classic example of aromatic hydrocarbon: it is a benzene with a methyl group attached to one of the carbons. If the ring contains one or more atoms which differ from carbon, these compounds are called Heterocycles, and the atom is called heteroatom. For example, in figure 4, in the furan, O is the heteroatom of the molecule. Fig 4. Example of aromatic compounds. From left to right: pyridine, thiophene, furan and pyrrole. Aromatic compounds are generally apolar, and therefore they are not miscible with water. Some of them are unreactive, so they are used as solvents for other nonpolar compounds. Benzene, in fact, is a common solvent used in the lab, although chemists always try to use alternative solvent to it, due to its toxicology. When 2 functional group are present in the aromatic ring, they are called in a different way, depending on their position in the ring: if they are close to each other, they are in -ORTO position, if they are separated by 1 C atom, they are in -META, if they are separated by 2 C atoms, then the compound is called -PARA. Fig 3. From left to right: benzene with 2 Cl in orto, meta and para position. Scheme 1. Generic electrophilic substitution of the benzene. E+ is the electrophile. If the H is substituted by a Cl atom, the reaction is called Chlorination. If it is substituted by a Br, we are talking about a bromination reaction. 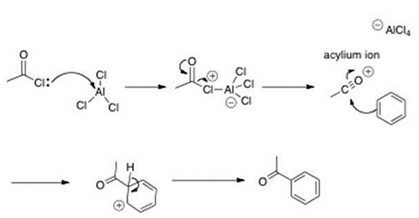 Another important reaction that is very common in organic chemistry is the Acylation of Friedel – craft, which involves the use of a strong Lewis acid as the catalyst and a mono-acylated compound is formed. Let's remember that a Lewis acid is defined as a chemical that contains an empty orbital able to accept an electron pair. Poly-aromatic hydrocarbons are components of atmospheric pollution and are known carcinogens. Continuous exposure of these compounds are associated with increase risk or d diseases correlated with cancer and bone marrow failure. This is why when used in the lab, benzene needs to manipulate exclusively under special system of aspiration, with eliminated the toxic fumes of these compounds.